The “culture of death” is attaining that which not even the atomic bomb was able to: extinguish Japan’s population. A survey by an ad hoc subcommittee of Japan’s Policy Board concluded that by 2040, almost half of the country’s municipalities will face difficulties to continue existing normally, BBC Brazil reported. The study focused on the demographic of women aged between 20 and 39, who are the key to ensure the future of the Japanese population. 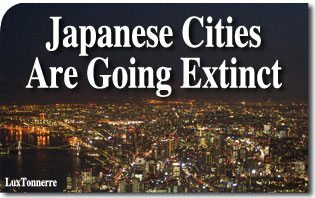 Led by Hiroya Masuda, a former Minister of Internal Affairs, the subcommittee drew up a list of cities, towns and villages whose populations will decrease by at least 50% in the period between 2010 to 2040 if current anti-birth trends continue. The estimate is based on statistics from the National Institute of Population and Social Security Research. The Institute pointed out 896 municipalities, or 49.8% of the country, as sites where the population may disappear, becoming ghost towns. In the coming decades, 523 towns whose populations are under 10,000 residents (about 30% of the total) will tend to “break down” for lack of children. Conversely, the population increases in large cities where people are looking for jobs, money and excitement all the while not thinking of founding a family and having children. The Japanese government wants to form a committee to deal exclusively with regenerating inner cities by focusing primarily on creating jobs for young people and increasing the birth rate.